The TF website is a new and easy way to promote music (Notably via The TFTV music show and public ratings/interaction via the TF site utilising Twitter, Facebook and Disqus). Please watch the video to see the details and benefits and click "About" at bottom of page for further background and information. 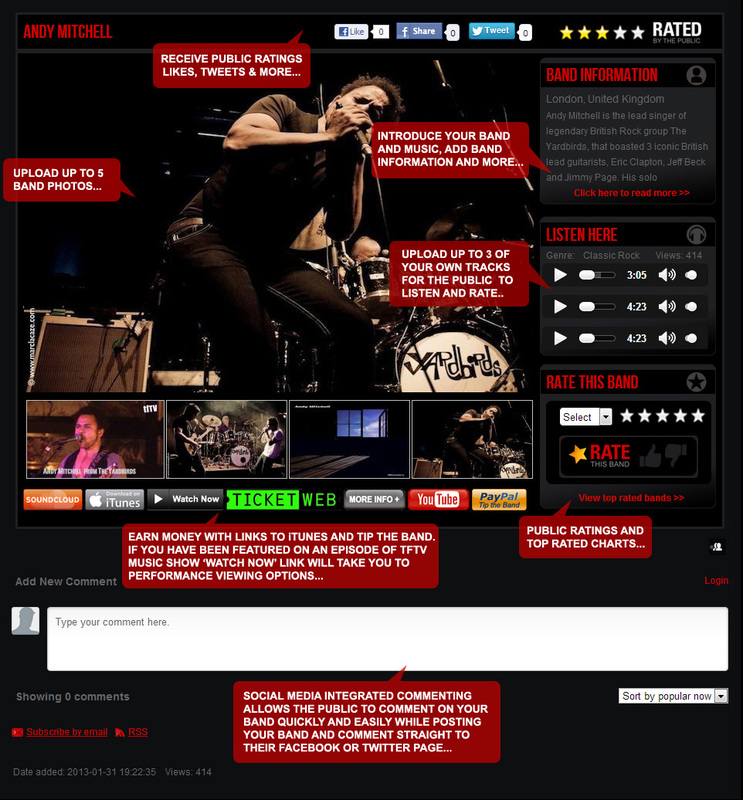 A feature full profile page including band photos, mp3 tracks, bio, iTunes, Tip the Band, YouTube links and multiple share features makes it easy to reach thousands of potential listeners (Link options at the discretion of TF). The public can rate you helping you get exposure in the Top rated chart. This process helps us to select talent to perform on The TFTV music show. Working like a filter, the more public ratings you receive the further up the TF Music charts your music will go! FIND OUT MORE... VISIT OUR ABOUT PAGE FOR THE FULL STORY AND INTRODUCTION VIDEO.